There was little religious literature in America, other than the Bible, in the early years of the 19th Century and that troubled Reverend William Allen Hallock. Like many others, the austerely religious Protestant minister saw the rapidly developing cities with their the waves of unwashed immigrants as fertile breeding grounds for sin and corruption. One weapon in combating the wickedness was the distribution of tracts—religious pamphlets and fliers aimed at putting wayward citizens back on the path of righteousness. Hallock was the agent for the New England Tract Society in Andover, Massachusetts, which was founded in 1814. The organization changed its name in 1823 to the American Tract Society, hoping to broaden its influence and distribution. A year later a similar organization, the New York Religious Tract Society, sought to join forces. And they did. Reverend Hallock, believing that the society should be headquartered where it was most needed, “the great wicked city of New York,” helped arrange for its move there in May 1825. Three wealthy New Yorkers, silk jobber Arthur Tappan, merchant Anson Green Phelps and banker Moses Allen spent $15,000 on the land at the southeast corner of Nassau and Spruce Streets for the Society’s new home. Within a year the four-story Tract House designed by City Hall architect John McComb Jr. was completed at a cost of $26,000. The first year of operation the Society printed almost 700,000 pamphlets and fliers. By 1846 the building was insufficient to house modern steam-powered printing presses and the American Tract Society razed the old Tract House, replacing it with a five story structure completed in 1847. The Society used the top three floors and rented out the lower floors to tenants such as the highly successful print-making company of Currier & Ives. By now the Society was printing over 5 million tracts. The American Tract Society, which for decades had grown more successful, was suddenly hit hard by the Financial Panic of 1873. The financial problems became such that in 1886 there was serious talk about selling the Tract House building. The Society plodded along until another financial recession came about in 1893. The Executive Committee realized that “a bold course of action” needed to be taken. That course of action was to abandon the Tract House for more affordable space further uptown, and build a modern skyscraper on the site. The valuable property sat in the midst of the New York publishing district and the rental income would, at least theoretically, rescue the Society. The newspaper predicted the cost of the completed structure to be a staggering $900,000—an incredible amount of money for a cash-strapped religious organization. It was to be “as nearly fireproof as possible” and in a clever marketing scheme to take full advantage of the soaring height of the building and its resulting views, the entire top floor would be a restaurant. Architect Robert Henderson Robertson was commissioned to design the building. He was already well-known for his own version of the Romanesque Revival style that used chunky blocks of rough-cut stone blended with terra cotta. But for the towering American Tract Society Building he tempered the heavy style with the more refined Renaissance Revival. Construction—which included the largest derrick ever built in New York City for building purposes--finally preceded. But almost immediately an incident occurred that ended in devastatingly negative public opinion. Before long The American Tract Society would wonder if its decision to build a grand skyscraper had been a good one. On the afternoon of May 16, 1895 a young plasterer’s assistant, Michael Melvin, was working high above Nassau Street. The laborer earned $2.75 a day to support his wife and three children. Melvin slipped and fell through a hoistway, falling fourteen stories to his death. New Yorkers, knowing that the building under construction belonged to a Christian benevolent society, understandably wondered if the American Tract Society would come to the aid of the family. It didn’t. New Yorkers were offended that the Society, whose new building was now estimated to cost $1.05 million, would not offer a small sum to the widow and her small children. But they were about to become even more offended. By the end of the day on Friday May 17 the workmen themselves had contributed $106, just about enough money to pay for Melvin’s grave. Passersby dropped coins and bills into the box on their way to and from work. Then, in yet one more callous move, The Tract Society ordered the box removed. Feelings of compassion towards the workers and Michael Melvin’s family swelled and resentment towards the American Tract Society festered. As a direct result, rumors started circulating that charitable donations to the Society had been diverted for the construction of the new skyscraper. Publishing Secretary The Reverend William W. Rand denied the charges, but they would not go away easily. A year later, with the building completed, Alexander Jay Bruen borrowed the Society’s idea of dissemination of information through pamphlets and published one entitled “Our Charities and How They Are Managed.” In it he assailed the new Tract Society Building. The American Tract Society Building’s bad luck and bad press continued with repeated elevator accidents the first year. 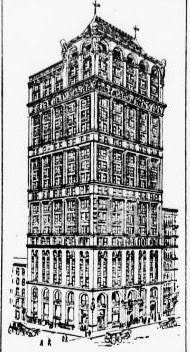 Between the building’s opening and November 16, 1896, three elevators fell several floors, injuring passengers. In the meantime, the building had filled with various tenants, including publishing firms like Illustrated Record and Ladies’ World. In 1897 the Internal Revenue Collector’s office was here and would remain until the new Custom House building was opened in 1902. Mapes-Reeve Construction Company was on the 11th floor, the Gold Point Mining Company was on the 18th, and lawyer Benjamin Levy had his offices in the building. The battle, it turned out, was the result of an on-going feud between two publishers. Yet the building remained filled and the Society struggled on. In 1902 the six elevators, which had earned a dark reputation, were carrying 14,204 passengers between 8 am and 6 pm daily. On May 17 that year George Shearer, who had offended so many with his comments about Michael Melvin, hosted a luncheon here for 600 of the commissioners of the Presbyterian General Assembly. He then took the group to the roof “where they got a bird’s-eye view of the city,” reported The New York Tribune. The luncheon was not nearly as interesting to newspaper readers as was the dinner held at the rooftop Eyrie restaurant a month later. The Thirteen Club joined the Vegetarian Society on June 13 in a curious ceremony. Members of the Thirteen Club, whose purpose was to deride superstitions, walked under a ladder, shared a cake in the shape of a coffin, and broke a mirror. Thirteen shards of the glass were distributed to members. 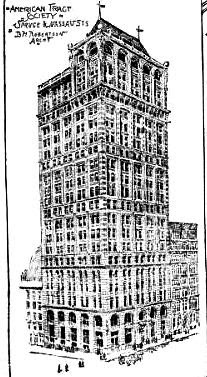 In 1919, however, the newspaper opted to move on to the Stewart Building on Chambers Street and, simultaneously, New York Life sold the property to Frank A. Munsey. Munsey had purchased the Stewart Building two years earlier. Throughout the 20th century the American Tract Society Building survived nearly intact. Recognized as one of the earliest extant steel-framed skyscrapers in the city, it represents the bridge between traditional masonry architecture and the soaring high-rise buildings that were soon to come. And today the elevators operate much more safely. Another one I'd always been curious about. Thanks. The caryatid strapped to teh building is lame but I guess it is better than being stripped off entirely. Wonderful building in an area once known for all its publishing skyscrapers. Great article! I've been researching this building for a while, and hadn't come across the story about the building inspectors' corruption yet. I'm also pleased to report that the building and the caryatids in particular have gone through a restoration. They're looking much better these days.